Night #2 was spent in perfectly adequate, clean, quiet accomodation with decent air-con and hot water...all for 500 baht [about US$16]...the only thing missing was breakfast. No problem, of course, as we had already found a place that offered breakfast just 50 metres away. So, at 0700 we showed up for breakfast, as arranged last night. There would be a short delay, as the Italian Coffee Machine was just warming up. So, we wandered around. I noticed there was a sign saying this place offered rooms for rent as well as breakfast and bicycles for rent. We asked to see the accomodation...very comfortable with air-con, fans, hot water...breakfast included...bicycle hire included...off-road parking for Tim's limo...350 baht [about US11.00] per night. We delayed our decision, pending the quality of the coffee and the breakfast. While awaiting the cooked breakfast, many pleasant ladies began to arrive and make themselves busy with their cotton-weaving looms all around the table where we sat sipping our coffee. What a delight to observe...traditionally dressed ladies setting up their looms, smiling at us, chatting together, happy to explain what they were doing. 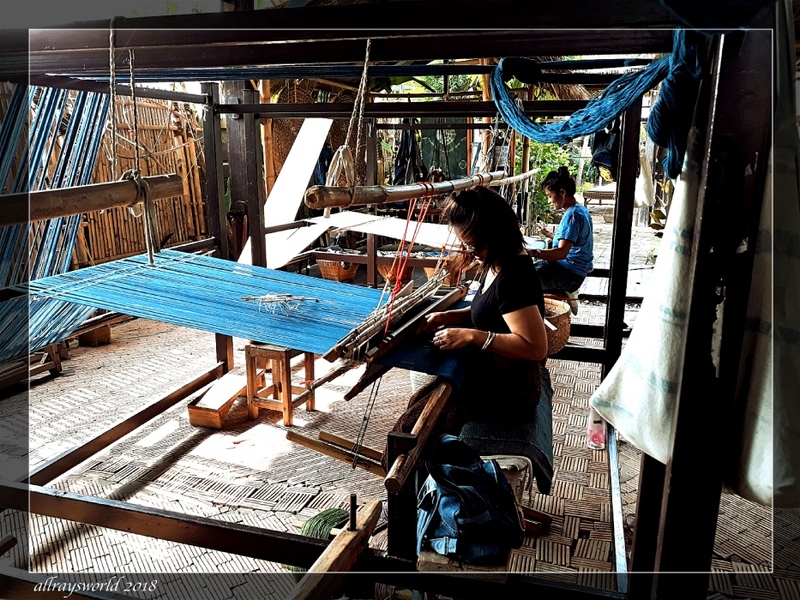 This place is a sort of Artist's collective, specialising in the manufacture of cotton materials that are spun, dyed and woven on the premises...their speciality is Indigo dyeing. The cooked breakfast was better than excellent! We immediately booked their four-bed dormitory for 2 nights...they gave us the bicycle hire for free. C'est intéressant de voir l'intérieur d'une maison. Les tisseuses font un superbe travail. Ray: Un endroit très intéressant et confortable. L'atelier de teinture est à l'arrière de la maison, aussi. Ray: Yes...one of the great pleasures from travelling, Astrid. You're gonna end up with a good book of this trip by the time you're done, Ray! Ray: I have already created the pics-only version of the book, Ginnie...one copy for each of the Lads. Ray: Yes...great fun. Some of the gals were a bit flirty, as were some of the Lads...totally safe behaviour in these circumstances. What a wonderful story/ life/ situation to find yourselves in/ price/ breakfast/ girls/ etc/ etc..
Ray: They even had a wonderful cat...looked quite like our Brownie...that kept trying to sneak into the dormitory so it could sleep with its new best friends, Chris. Sounds like a good result. Did the ladies at the loom loom over you at night, too? I'm impressed with the prices I have to say; I'm paying around US 140 for a night in north east Scotland. Ray: I think US$140 is about the cost for each of us for the 5 days and 4 nights...all inclusive, including even re-imbursing Tim for his gasoline costs, and the beer. The ladies were delightfully flirty whist looming, Alan, but left us alone in the evenings. That is a wonderful story Ray, and I can attest to the joys of underplanning. I like surprises, hopefully good ones, and the joy of a trip for me is discovering something good out of the indigo. On our trip to Spain, on our second night we stopped at a seaside town only to discover that it had the first house designed by Gaudi, and it was open to the public. Ray: Yes...I really enjoyed your reinforcing anecdote, too, Chad....over-planning is to be avoided. 'excelent' is the right word - in every respect! Ray: A wonderful experience, Philine...and the ladies would have taught us the fundamentals of weaving if we had the time to do it. This really is a most amazing adventure you lads had, it seems as if it unfolded into unplanned activities as you went along. Ray: Our short, cheap trips turn out mostly like this, Brian...I cannot recommend too highly the benefits of under-planning vacations. #3. Respond to the voice in your head that says "I wonder what is down there?" Sounds like a fantastic deal! Entertainment with breakfast sounds good too. Ray: Breakfast was a wonderful experience in this place, Mary. Sounds as though you got lucky! Ray: It seems to be a common experience on these little trips, Tom. Very friendly ladies, too, Louis.